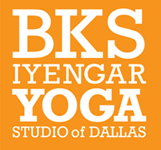 Start taking classes at BKS Iyengar Yoga Studio of Dallas and other studios! Level 1 is an ongoing class for students with a basic understanding of the “asanas”(postures). Most students coming into this class have completed at least 8 weeks of the Introductory Class. Level 1 classes introduce the next level of asanas, such as back bends, forward bends and inversions. All systems of the body are affected: muscular, skeletal, circulatory, respiratory, digestive, reproductive, endocrine, lymphatic, and nervous system. In this class you will build the strength, stamina, flexibility and concentration required to safely advance to Level 2. Please bring comfortable clothes, water and a yoga mat. They are also available for rent. This is what I’ve been missing in my yoga practice. Now I feel like all the yoga I’ve done was kind of “fast food” yoga. Here I got a taste of “gourmet” yoga. My heart rate went up doing simple poses because Randy teaches how to do the “simple poses” correctly. I finally feel like I know what to work toward. Randy is bloody brilliant. Most classes out there seem to be about going as complicated as quickly as possible, but Randy actually cares about technique and gives attention to everyone in class and takes time to learn your name. He also has a quirky dry humor that keeps everyone in a good mood. Randy, David, and Tatyana are great instructors! Absolutely love this studio. Excellent guidance from Randy. A great place to grow your yoga practice. Tough love. It's technical yoga, not gym rat hot yoga. thanks for the review - wow 5 stars that is great!